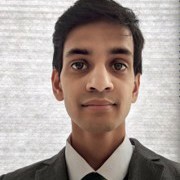 Brit Patel graduated from Queens’ College, Cambridge (M.A.S.t) with a Master’s in Mathematics in 2017. Prior to this, he received a Bachelor of Science in Physics with First Class Honours from Queen Mary University of London (BSc). Brit is a highly numerical individual who has four years’ experience tutoring students, from a range of educational levels, in mathematics and physics. He prides himself in quickly identifying students' weaknesses before using interactive learning methods to effectively strengthen their subject knowledge. Having sat most English entrance exams from 11 plus to STEP, Brit understands the nuances of the different syllabi and tailors his tutoring accordingly. Brit enjoys seeing his students succeed and towards that end provides regular diagnostic tests to ensure progress is being made with each of his students. Queen Mary University of London Physics Bsc. Brit has over 4 years of experience tutoring students from KS3 to Degree level. His general focus has been on student orientated mathematics and physics tutoring. He started tutoring through his university mentoring program before moving on to private clients found through the SuperProf platform. Recently he has been working with BE Education as a subject specialist in Mathematics and Physics.